If there was an alternate name for this surf store it would be the longboard shop. Our epic range of longboards can cater to the absolute beginner right through to those wanting to compete in the longboard surf series. Our constructions include the traditional PU right up to the tuflites dubbed the "unbreakables". Whether it is a straight line log or a performance nose rider our ranges from CJ Nelson, Guy Takayama, Donald Takayama, Harley Ingleby, Ben Skinner, Walden, Creative Army, Channel Islands, Admiral, NSP, and Torq we have the right longboard for you! Through the middle is a straight template and flatter rocker. Effortless paddling and glide for early wave catching and trim. Up at the front is a wide longboard nose with a single concave underneath, a soft rail and medium entry rocker. It’s a combination made for solid, stable nose rides in addition to easy carving. The Torq Tec Horseshoe longboard will be your lucky charm when it comes to catching waves. It’s classic longboard shape with low-rocker, blended concave nose, tail and nose kick, 50/50 rails, and thruster fin box setup creates a board that is easy to glide and noseride. Square tail, this board performs well in small to medium sized waves and at all types of surf breaks. Torq TEC, Torq Epoxy Composite offers our user friendly performance shapes in our most advanced epoxy lay-up to date. Using a mix of plain weave fibres and Carbon, these boards offer the best strength to weight ratio on the market. For mid-lengths and longboards the lay-up features a carbon stringer to the deck and bottom for a new level of torsional strength, plus 2 T-stringers on the longboards for additional responsive stiffness. About GSI's SLX construction: SLX Epoxy produces a controlled flex pattern by combining the versatility of epoxy materials with the added advantage of reduced weight. All SLX boards have an EPS core with a high-grade timber stringer, which is laminated by hand using epoxy resign, biaxial fiberglass and a specialized construction process. For 2017 Walden is introducing the Mega Magic 2, a new updated version of the Mega Magic… The Mega Magic has become one of best selling Walden surfboard designs ever, it shares the design aspects of the Magic Model but with added volume. This board has become so popular because its increased volume allows a rider to move to a shorter board while maintaining stability and float, yet it still manoeuvres with all the performance of the Original Magic Model. The Mega Magic 2 nose has been slightly pulled in – still excellent for nose riding, but the narrower nose will also perform better for more top to bottom riding. Walden took out the step rails for a smoother transition from deck to rail creating a thinner rail for more sensitivity, feel and control. Introduced FCSII fin boxes to the whole line up, snap in fins allow more versatility of fin selection on the fly. Board Concave Designed and Patented by Steve Walden, the Magic bottom is a complex design including chines and single to double concave features. Walden's specific combination and placements create a board that has great lift and speed but also initiates turns easily. A real all-rounder, still long enough to get on the tip but with concaves and a chine rail design, it will surprise you with it's speed and agility. Named "Kanaloa" for "God of the Sea" this new Performance Single Fin features a wide nose, square tail, and single FCS fin set-up. 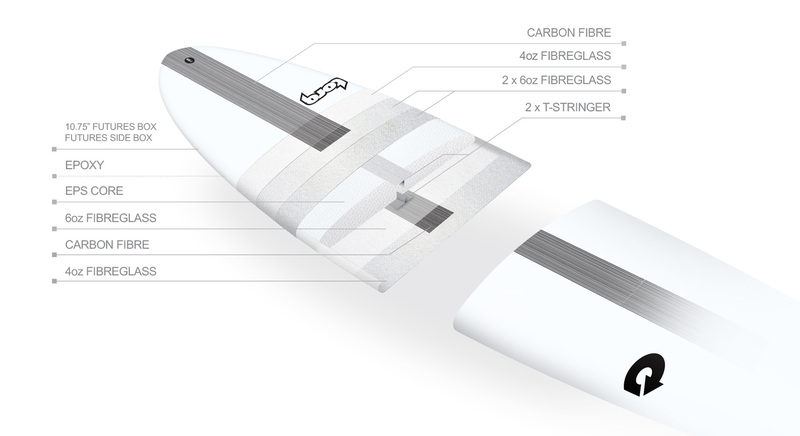 Guy designed this performance single fin to fit between a classic longboard and a 2+1 set-up. The Kanaloa provides excellent glide, smooth turns and is a great noserider. This Kanaloa Performance Single Fin model features Full XEON Fiberglass construction, with a total of 12 oz of fiberglass both deck and bottom for increased strength and excellent durability. Note: Longboard graphics may difffer from picture. 9'4" x 23 3/16" x 2 3/4"
10'0" x 24" x 3"